Holy Cross student Eve is already on the stage – and dreams of gracing the West End. Year Seven Eve has been performing in Dawn Dawson’s Academy of Dance and Stage since the age of six. “My aunt was an international dancer, she took me to some events, I started Irish Dancing when I was two and I have enjoyed dancing ever since,” said Eve. 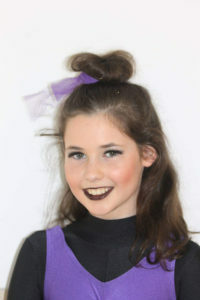 At Dawn’s Academy, Eve does a whole host of routines, including tap, ballet, modern and limbering classes as well as Acro Dance – which is gym and classical dance combined. “I also have singing and acting lessons and am at Grade Three’s and Four’s for most of my dancing. “I practise almost every day with full days on Saturday and Sunday. “I have performed at the Albert Hall in Bolton for Dawn Dawson’s Academy, featuring in five shows over the years. Holy Cross Drama teacher Kate Chapman featured in the West End and so Eve will be learning off the best.